Stunning genuine Paperglitz heart shaped chair boxes! These gorgeous little boxes have a 4cm cube base and a heart shaped chair backing. Can be used as a place card as well! Below the opening in the heart is a very small slit which can be used to hold a name tag if you wish (sold separately). Alternatively, as the slit is so small, you can use it without the tag option. Beautiful enough to use as is, or decorate it until you heart is content. This bomboniere box is made with card stock that is made in Italy with green Hydro Power - no dirty energy used to make this beautiful paper. This beautiful metallic orchid or amethyst colour card has a stunning metallic shimmer & is double sided in colour. Not as dark as violets and not as light as regular amethyst - this one is like a purple orchid. 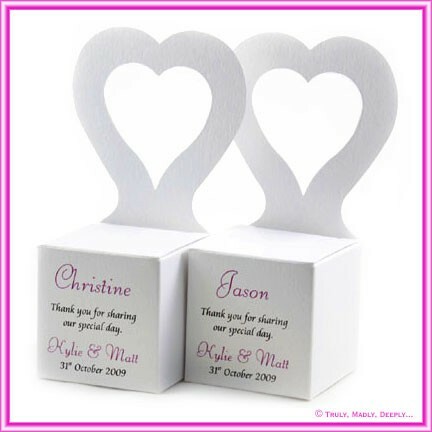 The box has a 40mm cube base and the heart backing stands 10.2cm tall and arrives flat packed for easily assembly - no glues required, just a few simple folds - break all folds, fold the base flaps in and lock the side tab - takes less than 20 seconds! 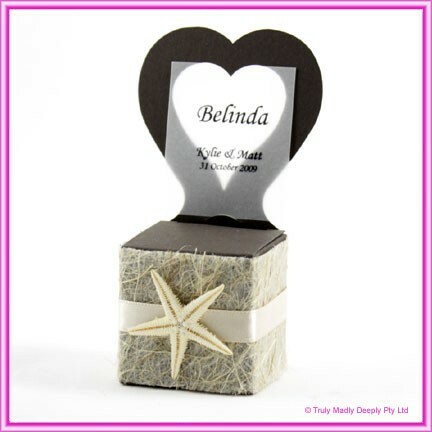 You can print directly on the box or use a name tag that is simply printed on to translucent paper (sold separately), trimmed to size and slides into the heart. The translucent is optional and sold separately. On the pictured boxes we have used Clear Translucent or Iridescent Pearl White Translucent. This is Genuine Classique Metallics™ stock from Italy - not a cheap Chinese flimsy printed white copy.